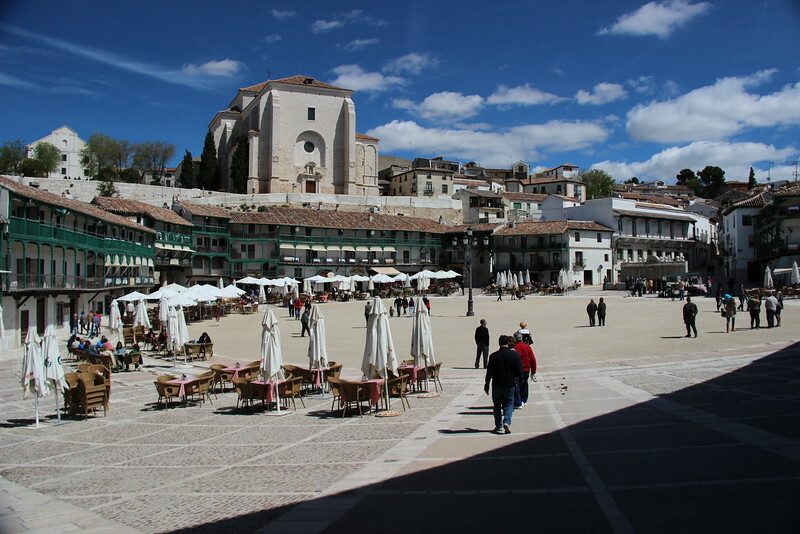 Chinchon is a great day trip from Madrid. Our extended family has experienced a couple of medical emergencies this week. Watching our loved ones deal with them has reminded me of how important it is to be prepared when it comes to identification and insurance. When I’m hiking, on an active cruise excursion or enjoying a new travel adventure, I wear pants with a zippered pocket for carrying my drivers license, medicare card and supplemental insurance card. And if you have life-threatening medical conditions, I recommend wearing a medical ID bracelet. Being prepared is an important step on a boomer travel adventure. We’re talking Spain travel this month and if you’re planning a visit to the capital city Madrid, there are a lot of great options for day trips. Two of my favorite Spanish towns to visit on the weekends are Segovia and La Granja. But you can easily go to someplace a little more off-the-beaten-path like Chinchon. No matter what you choose, you’ll see some beautiful areas outside of the city! Any hikers out there? This week, our guest contributor, Vanessa A Nirode, gave us some useful tips for hiking in Dubrovnik and Split. And if your travel plans include Key West, Donna offers ideas on what to do: If You Only Have One Day in Key West. Hey cruisers, save money by using Donna’s suggestions as an independent cruise excursion. For all of you who are curious about adult coloring, here’s your chance. 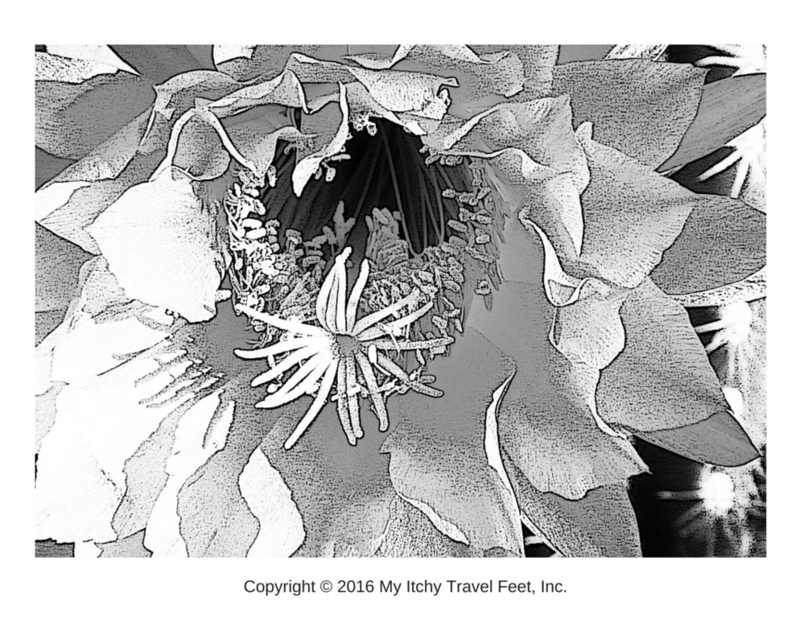 This pretty cactus bloom is from Donna’s book, Coloring the West. Print out this free coloring page (download it here), buy a pack of coloring pencils and give it a try. Don’t have coloring pencils? Crayons work, too. If you like it, then purchase Coloring the West for more coloring pages guaranteed to relieve stress. And remember to share your finished coloring pages by sending them to our email address. We want to share your masterpieces with our readers. Want to read more about Alan and Donna’s recent Antarctica cruise? Donna has a guest post this week on Green Global Travel describing her experience Exploring Grytviken, South Georgia Island. Would you rather hear about Donna and Alan’s Antarctica cruise? Last Saturday, Donna shared details with Kevin and Sue McCarthy at the Travel Planners Radio Show. Click to listen: Segment 1 and Segment 2. Disclosure: We’ve included Amazon links for your convenience. However My Itchy Travel Feet receives a small percentage of the sale at no additional cost to you.